Akaska campground owner Larry Gillies started small with D & S campground. Here’s a little bit about the Akaska campground owner Larry Gillies. 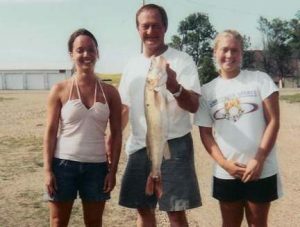 Growing up in the Watertown area, I developed a love for hunting and fishing. I enjoyed spending weekends with family fishing in the Northeast Lakes in a bus converted into a camper. I loved to hunt pheasants, ducks, and geese with friends in the fall. I spent my free time hunting and fishing in the Northeast Lakes, James River, and Sand Lake Refuge areas with friends and family. In the 1970s I was introduced to the Lake Oahe and Swan Creek area by friends. The area was perfect for my love of fishing and hunting. There was plentiful fish and wildlife. After starting a family, I started bringing them along on my fishing and hunting trips. We spent our summers fishing on Lake Oahe and the kids loved the campfires. Akaska started becoming a hot spot for hunters and fisherman. The boat docks became crowded and need for campsites and lodging increased. In 1994, one of the very friends that brought me to the area for the first time told me about a lot that was for sale. He thought I should buy it. In 1994, I purchased the land that I would developed into D & S Campground, named after the initials of each of my two kids. It started as a bare 190 x 190 foot lot and has expanded numerous times from the original 16 campsites to over 30 campsites, indoor lodgings, and a boat storage facility.